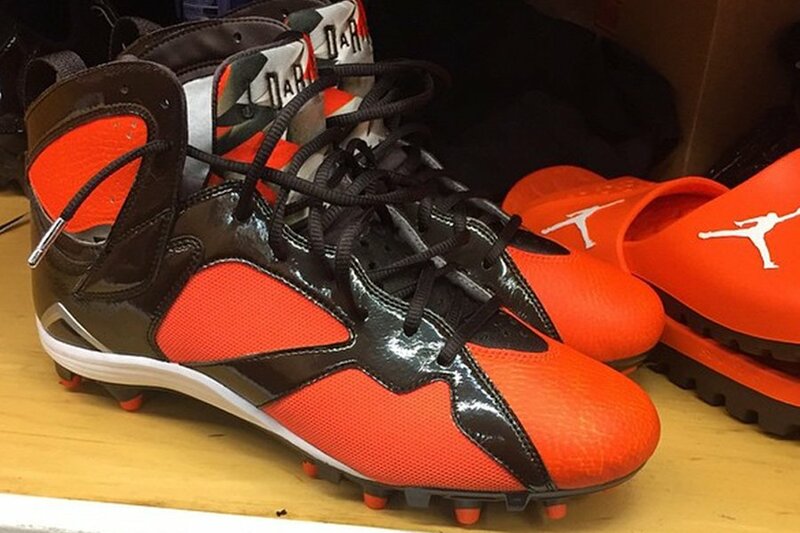 Joe Haden's Air Jordan 7 PE "Browns"
Cleveland Browns Cornerback and long time sneaker collector, Joe Haden, shows us his exclusive Air Jordan 7 cleats from Jordan Brand. Having signed the dotted line in July, Haden is one of the newest pro athletes under the Jordan umbrella. As expected, this pair of cleats follow the Cleveland Brown’s color theme with brown patent leather, orange mesh panels and orange tumbled leather on the toe box, as well as on the ankle. The bottoms follow suit with a primarily brown sole with orange-tipped spikes. Watch closely for these on foot as Joe Haden and the Browns take on the Jets September 13.